The garden fork is the favourite tool of many gardeners and used for: digging over, weeding, cultivating, managing compost heaps and moving fibrous stuff. 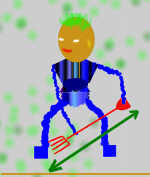 But it is especially useful for freeing the earth when lifting roots and tubers. When lifting potatoes there's less chance of slicing the spud with a fork. Not surprisingly specialised forks are available for many different jobs with different sizes, tine spacings and curvatures... more below. The Improved Garden Spork - U.K.
A Whole Range of Sporks - U.K.
Made by De Wit, Sporks are skilfully hand-crafted in tough Boron Steel and self-sharpening. They are made to last. Bear in mind that neither sporks nor forks are intended for levering rocks out of the soil. A whole range of alternative Sporks has been spawned - Sprake, Long Pull Spork, Tree Spork, Hand Spork and more... ... These exciting gardening hand tools all have the versatility, strength, and sharpness to cut through tough earth and weeds. You may think this Garden Claw tool looks gimmicky, but I find it does a good job. And there are situations such as double digging where it is particularly useful. It can also be used for cultivating soil, mixing compost, and working organic fertilizers into the soil surface. The best version of this tool is the Garden Weasel Gold Garden Claw Cultivator. This has 2 handles ideally designed as levers to twist the shaft which is height adjustable. Curved teeth on the tool head dig in and lift the soil. The professional technique has an upright stance to briskly bounce the tool while working your arms back and forth. You can quickly cultivate a border soil like this without bending. And further down you'll discover several different styles of garden fork perfectly designed for the gardening jobs you do. Below I explain a couple of effective techniques to help you weed, cultivate, and dig with a garden fork. Many weeds e.g. 'Couch Grass', 'Nettles' etc... spread into undisturbed ground to form shallow underground mats of stems. I use this method under established fruit trees. - NOTE: the weeds invaded the ground from beyond, but sheet mulch would have prevented this. You may bend your back a little but use the tool to give you support. This beats the rotavator because it doesn't chop up the weeds. Simply shake the soil free and dispose whole clumps of weed. And it saves the established tree roots. To easily cultivate between plants and among roots see the compact, shorter tined shrubbery forks on links below. Compost fork, manure drag fork, border fork, potato fork, shrubbery fork, digging fork, and pitch fork... These tools are specially designed for their job. Potato Fork - fewer tines that are curved to lift the tubers free of soil and with a short handle to facilitate close-up work. Pitch Fork - two long slightly curved prongs for moving loose material such as hay. Tarmac Fork - with 10 or more curved tines, might also be used for moving piles of leaves, potatoes, apples etc..
You'll find a wide range of quality Garden Forks designed for everybody and every job on these links. Compare with Potato Forks and Shrubbery Forks and other specialist tools on these links. The 203 Natural Radius Grip PRO Digging Fork is one example of a comfortable range of ergonomic designs that minimises stress. Radius tools are made with advanced materials and may include composites of strong light fibre glass, aluminium alloy, and steel depending on the model you choose. The Pro-Lite series for example are longer than the Pro series. The forward tilted treads are particularly advantageous for applying more force with good posture and control - check them out here. Solid traditional forks for American Gardeners. Honed by craftsman for the industrial revolution and post-war English gardeners here.